While the STRINGS are one octave above the other sound, it also sounds like a heavy highpass filtered pulse wave. The VIOLIO CELLO is a bit lowpass filtered and uses a more buzzy sounding wave shape. So, there are not that much possible sound variations available. On the left of the keyboard there is a power switch. Because on my unit the light of the switch is long gone, someone labeled the switch with the german words "Aus and "Ein". This translates of cause to "Off" and "On". To open the top you just need to undo four screws on the back and 2 under the unit. 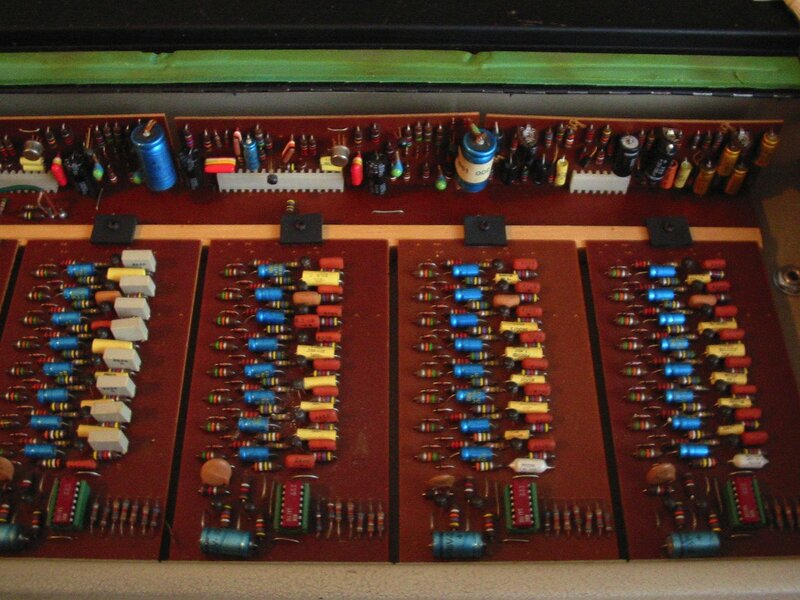 on the left board in the front you see the top oscillator and the two top octave divider chips (S 52255 and S 52256). These were used often in those days for organs. 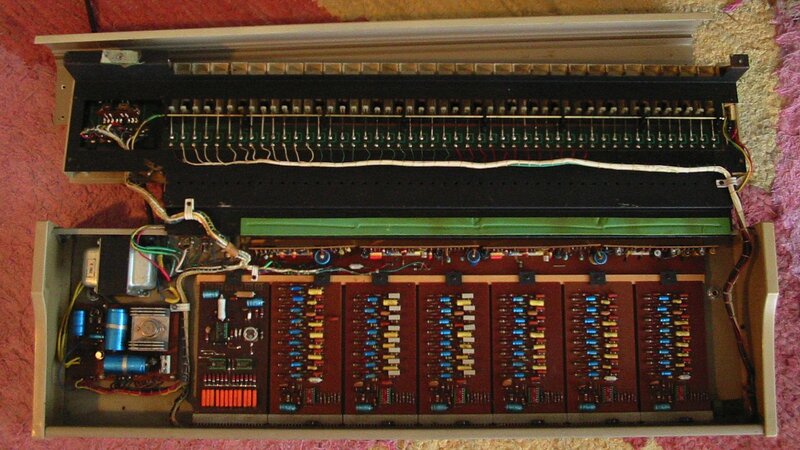 The other boards in the front are dividing down (chip SAJ110 by ITT) the pitch of the top octave. Each board is doing it for two notes. These boards also do the filtering and shaping. Note that each board is using slightly different capacitor values. These depends on the pitch and the needed filtering. And if you look real close, you will notice that the very left board is doing one more pitch then the others. 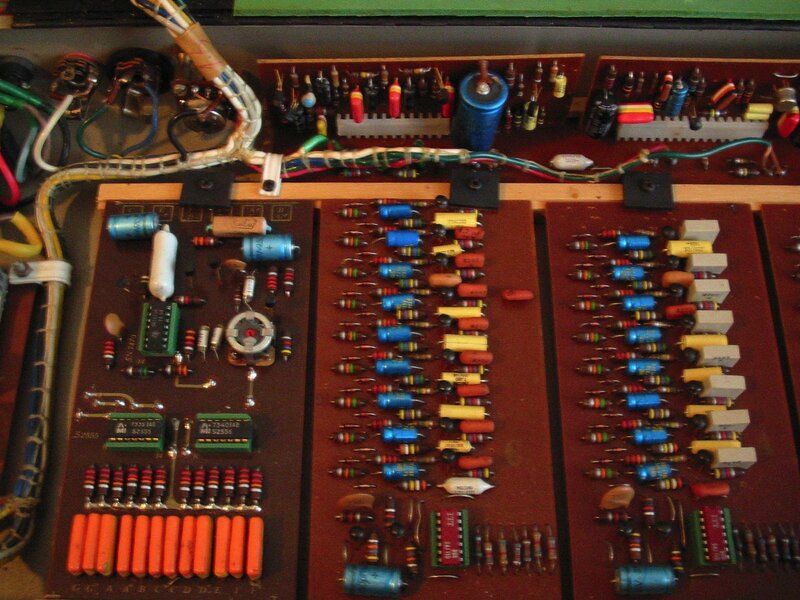 The top row of components there is doing the highest note of the 49 notes of the keyboard. So 6 boards with two notes each is 12 notes, the full octave of notes. And each board does 4 pitches per note (+ one additional on the very left board). The boards in the back add some ensemble modulation. But not by using a chorus delay line, but some tremolo modulation. And a vibrato patched to the top oscillator. 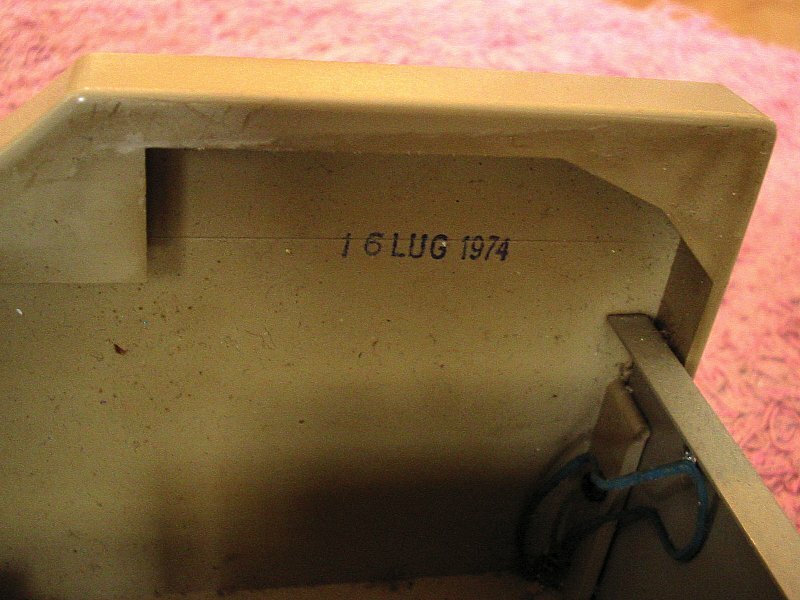 The date given on the inside of the left hand side panel tell when the instrument was build on the 16th of July 1974 ! Because there are not that much information known about the years of manufacture of the ELKa and the Hohner International version, we now know that it was at least build in 1974. Maybe also a year or two longer. Listen to the ELKA version of it for example on Klaus Schulze's "Bayreuth Return" track from the "Timewind" record recorded on the 3rd June 1975.